According to Men's Total Fitness, rowing machines are not only great for aerobic workouts, but they also work all of your body's major muscle groups. What's more, you don't have to go to the gym to work out on a rowing machine, as many manufacturers make high-quality rowing machines -- and even rowing machines that fold up for easy storage -- that are suitable for home use. Two popular types of rowing machines are the water rower and the air rower. Rowing machines are often used by people who are looking to get a full-body workout, and also by rowers to stay in rowing shape during the off-season. According to Men's Total Health, rowing is a natural motion, and is therefore fairly easy for anyone to pick up and do properly. 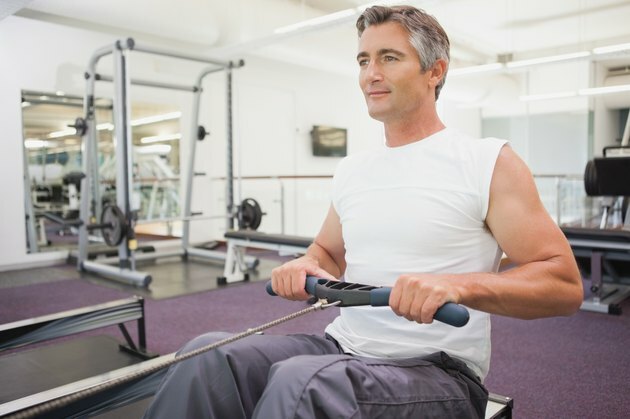 Also, rowing is a low-impact exercise, meaning that the potential for injuries to your joints is lower than on such machines as treadmills, for example. According to Sports Unlimited, water rowers offer a real-life rowing experience, as they emulate actual rowing. Men's Total Fitness notes, however, that air rowers are the type most often used by rowers during the off-season. Also, air rowers typically have a longer main rail, which is beneficial for users who are taller than average. According to Martin Cross, Olympic Gold Medalist rower, water rowers capture the true essence of the sport of rowing. Galt, a website that specializes in product buying guides, claims that water rowers perform like a boat moving through water. There is a considerable difference between the average price of water and air rowers. As of November 2010, water rowers range in price from around $700 to over $2,000, with most exceeding $1,000. Air rowers, on the other hand, range in price from around $300 to $700.